Mark estimates that our new garlic curing racks might save us about a week of labor over the course of the next fifty years. I figure he's not far off. In previous seasons, I've spent a lot of time hunting around in search of an area to cure garlic, onions, sweet potatoes, and butternuts. I generally rig something out of old screens my mom found by the side of the road, in which case the trouble is ensuring the vegetables don't get rained on. 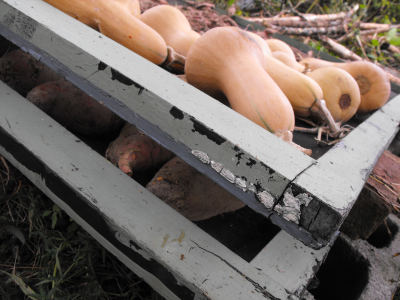 The only thing that didn't quite work as planned is the two by four rungs that I planned to climb up to put the vegetables in place. 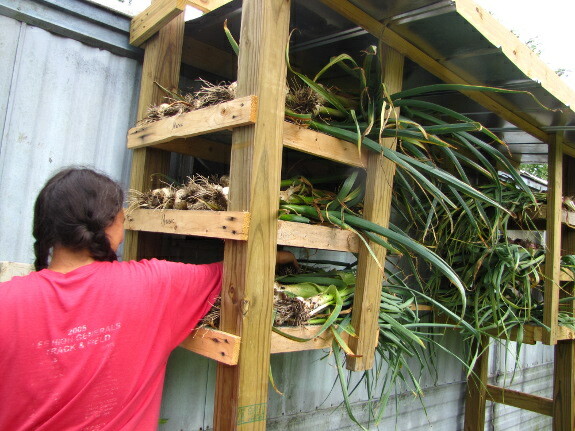 It was much easier to simply lean a ladder against the side of the trailer and go up that way, which felt much less precarious when I had an armload of garlic. I'm not yet sure whether we'll have enough surface area for all of our crops, though. The garlic filled all six racks up to the brim, and I might need to cure onions before the garlic is ready to go into bags. We'll cross that bridge when we come to it. Our chicken waterer keeps our hens laying at full throttle with plenty of clean water. 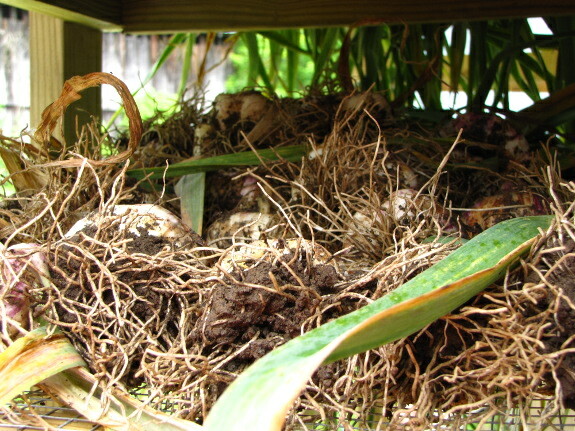 What garlic are you growing? 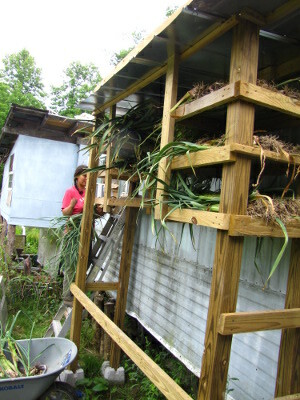 Can you tie/braid the garlic and finish drying it from the rafters of the barn? I might be wrong about this, but I thought your barn used to be for tobacco drying? I had always assumed that once a new roof was on that you guys would use part of that space for curing vegetation and drying herbs, etc. With all the straw in there, is there no room? Or is there some other reason I'm not grasping? I've enjoyed seeing peoples' bread tray drying racks. No bakeries closeby, or I'd try to snag some! Heath --- We grow Music (hardneck), Silverwhite Silverskin (softneck), and Italian Softneck (softneck, obviously). Music produces the most, biggest heads, but I've read hardneck garlic doesn't last as long, so we eat it first. The Silverwhite Silverskin keeps forever, and the Italian Softneck is midway between the other two in terms of keeping quality and bulb size. Mona --- We could definitely tie the garlic up, but my goal is to handle curing vegetables as few times as possible, thus the racks. 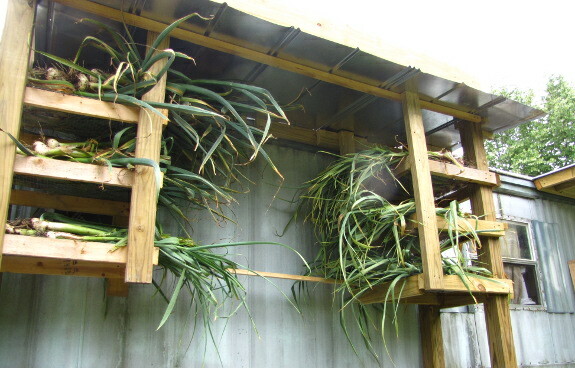 We tied garlic last year, and it dried quite well, but also go in the way of the tools in the only roofed area we had at the time. Tying also takes a lot longer than laying vegetables out on racks to cure, which is why I'm trying to move away from that method. Brandy --- We've got to organize the barn before it's usable for anything, unfortunately. We've been slowly but surely plugging away at it, but don't have a clear area for drying racks yet.